Posted by Vanessa at 11:46 PM . Please pray for my mommy, dad called me last night to say she was in the hospital, apparently she has been having pains in her abdomen and they are still doing tests to see what might be causing it. They don't know if it's cysts on her ovaries or appendicitis. My mom called earlier and said she is ok but she sounded a bit tired, she said that they are just waiting for the test results, but I hope she is REALLY ok and not just saying she is so I don't worry, since I am a worry wart. My parents' health hasn't been all that great this year and I am really worried; even though they are considerably young still (they had me at 19 and 25), I know stress and just getting older has taken its toll...I just hope things get better. 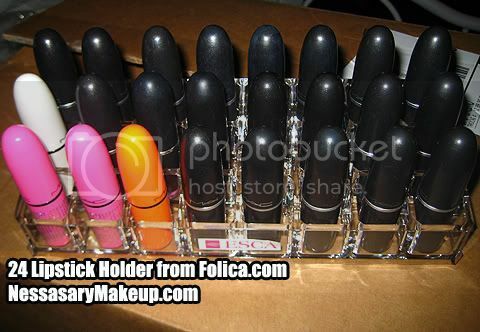 On a lighter note, I got my Esca 24 lipstick holder from Folica.com. It holds 24 lipsticks all nice and neat, and I love how this is tiered so each row is elevated like stadium seating, rather than just flat rows. I like it so much I wanna order the other one they have that has a separate compartment for makeup removing rounds, q-tips, or cotton balls. They are both made out of sturdy acrylic, not cheap plastic. 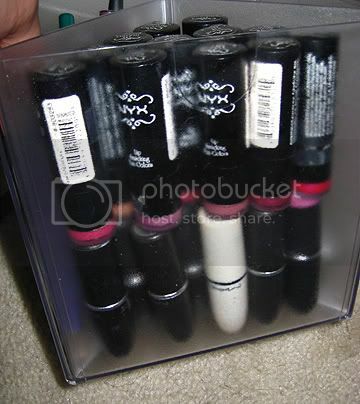 And the wells are deep enough to hold your lipsticks in place without falling over. It's around $14 (not including shipping, shipping is like an additional $6). 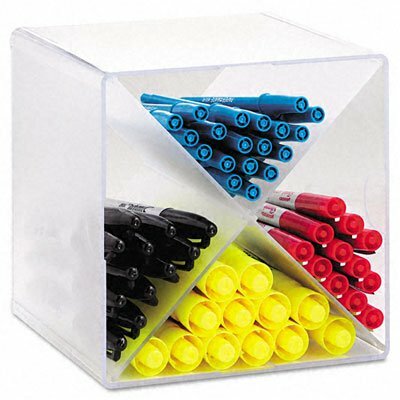 I have some of those office supply organizers too! I actually use them under the sink to sort out tampons and liners. LoL! 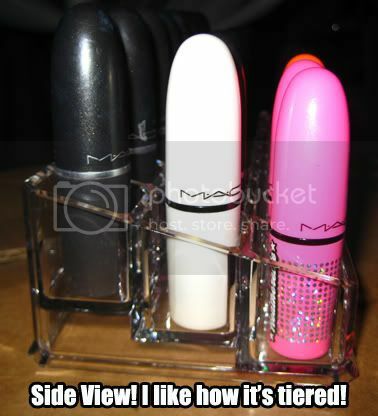 Nice lipstick holder tips! so cute! My prayers are with you and your family. Hope your mom's well. Sorry about your mum, sweetie, I'm sure she'll be fine. The naturopath in me wants to tell you that a B-vitamin complex is good for helping people to deal with stress. 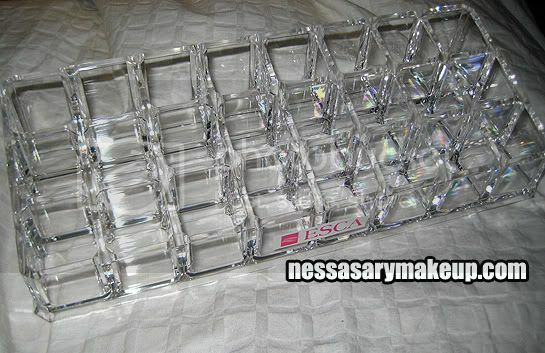 They have those lipstick holder thingys here too but I haven't seen any that are tiered! NICE! 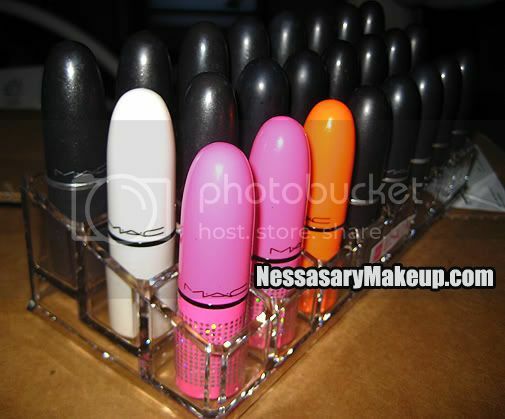 You're gun need like 10 trays for all yo'lippies!!! ;) lol. Hope you mom is better soon. Please keep us updated! That lipstick holder is a MUST HAVE! hey honey i'm praying for your mommy...i'm sure she'll turn out okay...the key is to be positive and stay strong for your fam :) love the new cosmetic holders! 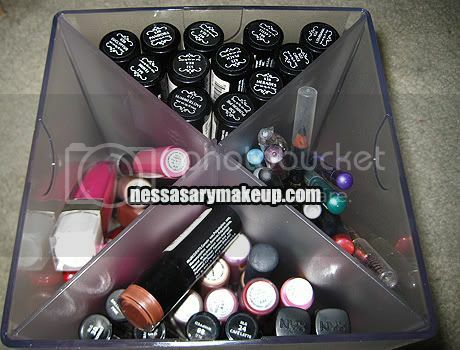 I have the lipstick one from the container store and I wish it was tiered too! Hi Vanessa - Sorry to hear about your mom. I can imagine that it must be difficult for you since you are so far from her geographically. Wishing your mom a speedy recovery. Also I have that x cube and love it, it's the perfect size for all my lipgloss and whatever mascara I've got in current rotation, as I usually have 6 tubes open at once. I do think it's a little bulky tho, I need to figure out a new place to keep it. i'm really sorry to hear about your mom! I hope everything is ok for your mom. Don't worry too much; either one of those possibilities isn't too serious. I've had ovarian cysts rupture a couple of times, beginning at the ripe old age of 16! It hurts, it goes away. If it's appendicitis, they take it out, it goes away. Be thankful the word "heart" isn't anywhere in that diagnosis! hope everything will be ok with your mommy. my prayers are with your mommy !!! i like the lipstick older! I hope your mom is alright!!! I wish the best for you and your family, V. Hope everything is well! The lipstick holder looks awesome. I need a bit more organization in my life! I know what you're going through. My parents aren't in the greatest shape, either. I'll keep you and your family in my thoughts and prayers. I hope everything turns out okay! Hey Vanessa, your mom and the rest of your family are in my thought and prayers! Everything will be fine soon :-). Either way she's in my prayers. May God watch over your mom throughout her time of need. Hope everything works out well! I pray that you mom is okay. I know it hurts to see the one who cared for you in need of care themselves, but try not to stress too much and just know that she will be okay. I also have that x cube organizer for my lippies. I got the idea from another blogger (I forgot who it was) but I absolutely love it. my thoughts are with you, your mom, and your family. Your family is in my thoughts. I'll be praying for you. aww don't worry so much! i'm sure your mom is going to be just fine. stay positive nessa! i hope your parents are in good health. i'm in the same boat as you, parents are getting old. time really grinds a person's health. le sigh. speaking bout lip containers, wouldn't you fret in finding the color you want amidst properly lined up lipstick? or do you pick at random lol? Your parents, as well as, your sisters and you are in my thoughts and prayer. I know how hard it is to go through. I've been there and if you ever need ears, I have huge ones! I was wondering if the lipstick holder from Lucia was 'deep' enough to hold a MAC lipstick upside down, so the label was visable? Leaving for Vegas! And of course Face Charts! Halloween Look & Tutorial: I'm a Leopard! Just a gal that loves makeup and exploring creativity and art. Not a makeup guru by any means, but just love experimenting and sharing tips and tricks. I apologize in advance if there is a delay in response as we often get swamped with emails and of course I have a real job and life in general. 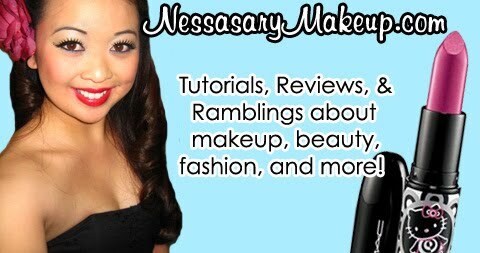 I am just a makeup-loving junkie who enjoys writing about beauty products and random stuff about my life and experiences. I am not by any means a "guru" or a makeup artist. I just love writing in general. All my product reviews and opinions expressed here on my blog, are that of my own and are based on MY own personal experience with that product, including those sent to me courtesy of a company that sends me one to review. Any personal information will NOT be given out and is merely used to enter contests on my site. Everyone is different and like with ANY product PLEASE use the products mentioned in this blog at your discretion and with caution.